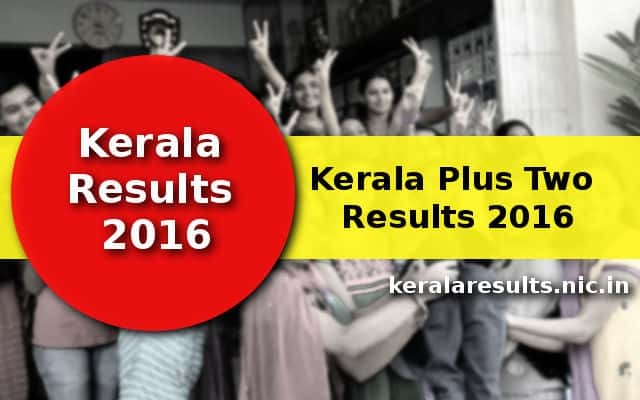 Kerala Plus Two Result 2016 is announced. Students who are waiting for Kerala Plus Two Results 2016 can check their results on the website keralaresults.nic.in. Chief Secretary S M Vijayanand officially declared DHSE Examination Results 2016 on 10th May 2016. 80.96 percentage students from DHSE Exam 2016 are eligible for higher education in this year. It is slightly lower than the pass percentage of 2015. In 2015 83.96 percentage students are passed the Plus Two Examination in Kerala. Of the 361683 candidates appeared for the examination, 292753 students become eligible for higher studies. The percentage of candidates become eligible for higher studies in Vocational higher secondary section was 87.72. The higher secondary and VHSE results were declared 15 days before the date on which the results were announced last year. According to the result document, 9870 higher secondary students got A + for all subjects and of this 6905 were girl candidates and the rest were boys. Answer papers of physics, chemistry and mathematics subjects were subjected to evaluation twice and if marks scored by students in the two evaluations were 10 per cent or above, such answer papers were subjected to a third time evaluation. Kerala Plus Two Results are available on the following websites. HSE And VHSE Results are available on the single website examresults.kerala.gov.in. To check the result the Roll number of Kerala Plus Two Examination 2016 and the Date of Birth is required. Kerala Directorate of Higher Secondary Education (DHSE) is conducting the Plus Two Examination and declaration of the result on every year. Kerala Plus Two School Wise result is also available on the website http://keralaresults.nic.in/dhse16/swr_dhse.htm. School Code is required to view the complete school wise result. Also school code is available with the school authority such as Head Master of the school. The mark sheet is also available to print. This mark sheet can be kept for future reference like college admission etc.